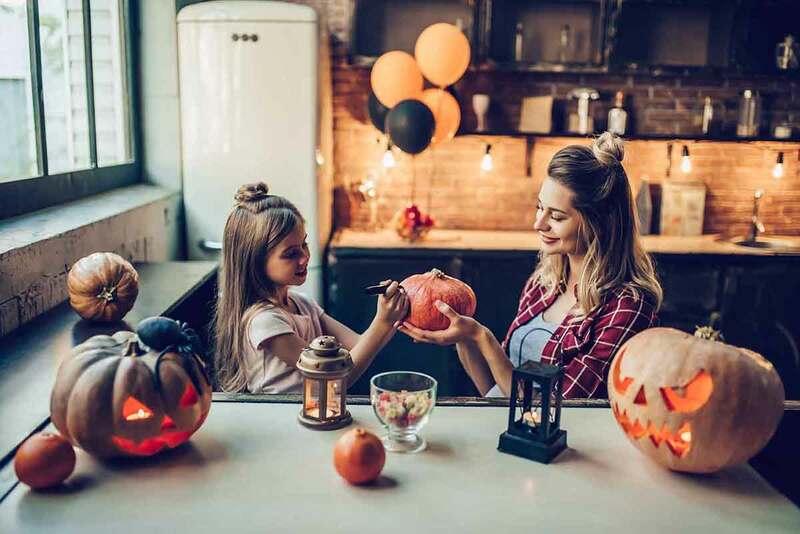 Skint Dad’s put together his top tips on how you can have a spooktacular Halloween without breaking the bank. Halloween never used to be much of a big deal when I was a kid, but as a country, we’ve become enamoured with it. Even if there aren’t loads of trick or treaters about, many families find it a great excuse to have a bit of a party and a get together. However, as Christmas isn’t too long off, trying to fund a themed party can be stressful and expensive. But, you don’t need to break the bank to have a Halloween party on a budget. With a pound shop in pretty much every town, there is no need to overspend when it comes to decorating the inside or outside of your home. A few quid on a handful of decorations can make do and the rest can be handmade. If you don’t want to go all out on decorations, first pick a colour scheme, bold and bright colours like orange, black and white that scream Halloween. When you have a colour theme, hand make a few decorations to bring it all together. For lighting, dig out the Christmas tree lights. Cut out some slits as eyes onto a toilet roll tube, then feed the lights through the tubes. You’ll have a spooky lighting display at no cost. Also look at creating some miniature ghosts with tissues. Simply thread some string through the centre and hold it up. Draw a couple of eyes on and you’ve got some floating ghouls. No Halloween is complete without a pumpkin. Lots of shops try and sell carving kits but they are not necessary as you’ll have all the tools you need in your kitchen already. Google patterns, trace what you want onto the pumpkin with a pen. Use an ice cream scoop to clear out the centre (save it for making a soup!) and cut out with a steak knife (it’s much easier to cut with than a standard paring knife). Dressing up is all part of the fun – but can get costly if you’re after a whole new wardrobe. You don’t really need to fork out too much to get a good look for less. If you’re struggling to think of what to go as then head over to Pinterest and see if you can find some simple, easy to put together costume ideas. Sometimes trying to have a look at the back of your wardrobe or what you’ve got lurking in the bottom of a cupboard may be best, especially if you’re running out of time. Then just accessorise. Try not to buy new as it’ll cost a fortune. Instead, look to see if you can pick up accessories from a charity shop or get them delivered quickly with Amazon Prime. Also look to see what you can do with make up. You can pick up sets of face paints cheaply at budget supermarkets and pound shops and they can transform a look. Whether you are fretting about trick or treaters, or perhaps just what to feed people at a party, a food budget for Halloween doesn’t need to scare you. When it comes to sweets and snacks for little monsters who knock at your door make sure you don’t buy branded. There are plenty of own-brand sweets that are perfect to be given away to trick or treaters that’ll save you a fortune. If you, or a friend, have access to a cash and carry, then head along and buy in bulk. Buying at cost price will be far cheaper than buying from the pound shop or supermarket. However, if you do need to shop at a ‘normal’ store, make sure you compare prices of multi-packs and check the price per unit on items. Some things you pick up in a pound shop are a LOT smaller than supermarkets so actually work out more expensive. When it comes to cooking for a few people, Halloween doesn’t scream a sit down three course meal. Instead look to find buffet style food and warming autumnal foods. Grab your slow cooker and get a big batch of stew or chilli prepared. It can be done in the morning, sit there all day and continue to simmer into an evening. Then, just have jacket potatoes on the side as they are easy to prepare. Half the fun of Halloween lies with the games and fun you can have playing them. Sure people dress up, but it’s easy to keep everyone entertained as well. If you have got people dressed up then why not have a fancy dress competition. Ask others to vote on costumes and perhaps give a wooden spoon to the not-so-best-dressed. You could even put on a Halloween themed scavenger hunt, with clues, small toys and sweets dotted around your home. There are tonnes of other ideas like eating donuts tied from string, or bobbing for apples (then putting your face in flour if you can stand the mess!). Why not try a mummy dressing up challenge and see who can wrap another person in a toilet roll from head to foot – it’s harder than it sounds. Whatever you’re up to this Halloween, just make sure to have a spooktacular time!